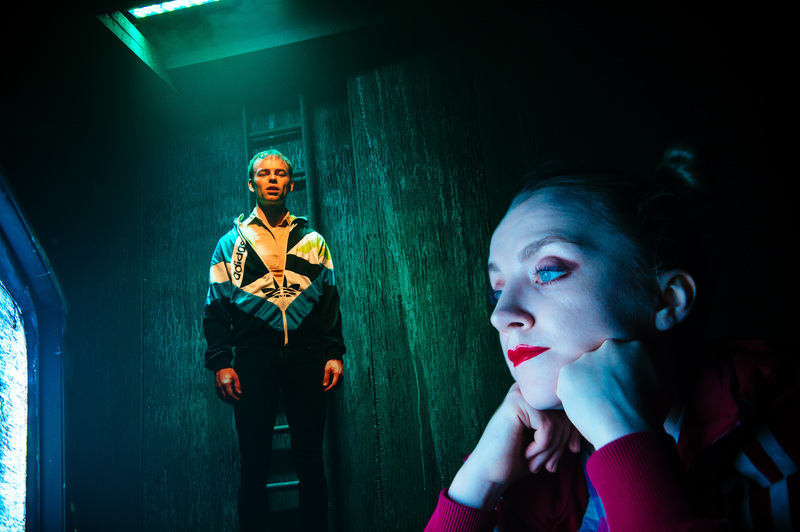 The isolation of the young and the lost: Gillian Greer reviews the 20th anniversary production of Enda Walsh’s first play. Disco Pigs at the Trafalgar Studios. Photo: Alex Brenner. Enda Walsh is a writer who expects a great deal from his actors. They must erect complex, lyrical and traumatically insular worlds, only to hurl themselves against the very walls they’ve built and tear them down again. His characters are almost always trapped and aching inside some self-made prison, and his explosive first play, Disco Pigs, is no exception to this rule. Set in Cork in the mid-nineties, Disco Pigs tracks the relationship between Sinead and Darren, next door neighbours born a minute apart and irrevocably bound. The self-styled Pig and the Runt adventure around Pork City, lilting in a near-unintelligible blend of Cork slang and baby-talk that has become their own vernacular, leaving a trail of destruction in their wake. It’s a play that functions as both a bellow of youthful disillusionment and a tender coming of age story – a tall order for performers Colin Campbell and Evanna Lynch. For it is they, more than anyone else in this production, who have to build the pigs’ world – vicious, defiant and fiercely protective, fuelled by drink and spontaneous violence that rumbles and erupts like a storm. The entire thing is wrapped up in their capacity for the mercurial, throwing themselves into the nightclubs, chippers and daydreams of the merciless Pork City with transformative ease. In this, Campbell in particular excels as Pig, melting and hardening in turns as is required. It is, as the play demands, an intensely physical performance, grabbing the audience by the throat and plunging them into a world in which they are not always welcome. Lynch, then, is more curious. Disco Pigs carries through it an uncharacteristically hopeful note in Runt, who dreams of a sophisticated life outside of the confines of her friendship with Pig. Here, she follows him along, wide-eyed, through the twists and turns of their imagined landscape, but always seems a little out of step. Though there is unavoidably a little of Luna Lovegood in her wistful gaze, she quietly unfurls into something more solid in the play’s heartbreaking conclusion. But their synchronicity as a pair early in the play was sorely missed. Without a bond, there’s nothing here to break. John Haidar’s direction further stymies things, with a few strangely obtrusive music cues and a pacing issue that frustrates some of the play’s most boisterous moments. At seventy-five minutes the momentum wilts on more than one occasion, and the production feels preoccupied with signposting to the audience that which should be obvious. Perhaps constructed with a mainstream, West End (read here: non-Corkonian) audience in mind, this feels like direction without full trust in the work. It’s been twenty years since Disco Pigs first debuted and the piece still bristles. The genesis of much of Walsh’s work can be tracked back to this short, sharp skirmish of a play, and though it’s undeniably dated somewhat (the opening lines reminds us that the duo would be almost forty now, probably drowning in negative equity and complaining about millennials) in the right hands, it’s still offers searing insights into the isolation of the young and the lost. There are some glimmers of that insight in this production, both from Campbell and Lynch, it’s just a pity it never got to truly shine. Disco Pigs is on at the Trafalgar Studios until 19 August 2017. Click here for more details.